Virat Kohli is a star cricketer but more importantly, he is an indulgent husband to actress Anushka Sharma. So while they are not busy with their work, they chill together like any other couple. Understandably they do not get a lot of time to spend with each other so they just make up for it by doing things they both love, like working out. Both Virat and Anushka are fitness buffs and do not miss out on their routine even for a day. 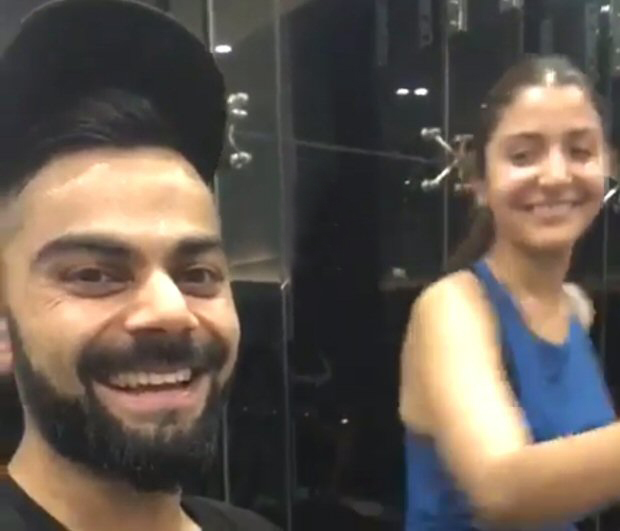 Yesterday, the Indian skipper, who is a fitness inspiration for millions in the country, posted a video with wifey and said some really sweet and encouraging things about her form. Virat said, “So guys doing another session of strength and mobility and look who I have with me. Working out like a boss. Having fun in the gym and she’s killing it- going on and on and on. She can do more cardio than me.” Anushka Sharma looked flushed with all the exercise and praise by her ultra fit husband so she just retorted with a ‘Rubbish’! One look at them and you would say “Rab Ne Bana Di Jodi”. He captioned the video as, ‘Training together makes it even better! @anushkasharma’. On work front, Anushka was in the United States to shoot for her portion of Shah Rukh Khan’s Zero. She just came back yesterday and looks like did not waste any time in hitting the gym.